My Year Of Star Trek: The Prime What Now? Here's an interesting tidbit: I'm actually kind of an anthropologist. I have a Bachelor's of Science in anthropology and I possess a savant-like, innate understanding of kinship charts, the human skeletal system, and concepts like third gender. I loved anthropology and considered pursuing it for a long time and I still haven't 100% ruled it out. The problem is that the path I was on--Cultural Anthropology--is all about the Prime Directive. You're not supposed to interfere with a culture. You're not supposed to do what you think is right for the people you perceive as needing your help--even when they ask for it. That's what brings me to today's topic. I made it through TOS, TAS, four movies, and most of the first season of TNG. We've heard the Prime Directive mentioned several times in all of that. Kirk dealt with it. I mean, he dealt with it by ignoring it but, whatever, that still counts. Then we get to Picard. Picard is kind of a slave to the Prime Directive, at least at first. He deals with it in multiple episodes and his version of dealing with it is a lot of hand wringing and trying to find ways to stay within the directive's boundaries. Today, I got to episode 22, "Symbiosis," which I think is the first truly compelling episode of TNG. Up till now, they've either been chasing TOS or just kind of meandering around, trying to find their own voice. "Symbiosis," changes all that by giving us interesting character moments in a story that twists and turns until the last act. Basically, the Enterprise comes upon a broken down freighter. The guy who captains it seems like he's really mentally unfit to be driving around in space but Picard goes with it and tries to help. The freighter ends up crashing into the sun but four of its crew are beamed aboard the Enterprise beforehand. The crewmen are from two different societies. They are the Ornarans and the Brekkians. 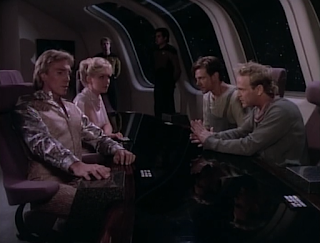 When everyone gets on board, we learn that the Brekkians are suffereing from a terrible plague and their medicine (which was beamed aboard before the crewmen) is the only thing holding off certain death. The Brekkians reveal that their whole society revolves around providing goods for the Ornarans in exchange for medicine. The Ornaran society's one and only job is to provide the Brekkians with their medicine. As the pretty blonde lady says, "The Ornarans provide us with the necessities of life and we provide them the necessities of living. It is a fair exchange." Ok, so that's weird and co-dependent enough but then it comes out that the Brekkians aren't actually suffering from a plague. They're suffering from the symptoms of withdrawal from their "medicine" which is actually a powerful narcotic. The Ornarans have been intentionally keeping the Brekkians addicted to the medicine for HUNDREDS OF YEARS and exploiting the Brekkian society for their own gain. Just look how extra blonde and smug they are. If I were Picard, I would just call a stop to all these exploitative shenanigans. I'd make these smug dope dealers go back their their ridiculous planet and start making their own clothes and doing their own hair and I'd give these poor, drug-addicted Brekkians some help with my high-class 24th century medicine. Then, I'd lay a big smooch on Beverly for figuring it all out. Basically, I'd Kirk it. But Picard doesn't. He explains to Dr. Crusher that, "the Prime Directive is not just a set of rules. It's a philosophy--and a very correct one." Beverly replies, "It's hard to be philosophical when faced with suffering." I'm with her. I love Picard and I think he's brilliant and usually right but if I were stationed on the Enterprise, I'd end up being court-martialed for violating the Prime Directive within like two weeks. Similarly, if I were an Anthropologist, I couldn't not help people. That's why I have a BS in anthropology but an MFA in creative writing. That's why, instead of sitting around in the jungle, studying pottery sherds or modern weaving techniques, I'm writing this Star Trek blog. And aren't you so glad I am? I've thought about this a lot. Journalists have a similar dilemma. If you are covering an event, is your obligation documenting the event or helping people who might need it? If you are witnessing suffering, will it do more good to record it and publish it, or to put down your camera and try to help the other person? It's a hard thing to reconcile. Yeah, I think about that a lot, even in reading National Geographic or something like that. Not surprisingly, I also wanted to do that job. I think I might be too much like Beverly in the whole emotional separation area. Indeed, we are! My sister was an anthro major and just got her copy of the long-awaited book, "Noble Savages." It's all she's talked about for weeks. But that was always a huge question for her. If you are studying a tribe and everyone catches a strain of cold foreign to them (brought by you), why shouldn't you give them the medicine you know would treat said cold rather than allow them to suffer for the sake of observation even though you are the very reason they are sick in the first place. Interesting stuff. Oh, that's awesome! I really want to read Noble Savages. Napoleon Chagnon (aside from having a totally awesome name) is such an interesting dude. The prime directive, not unlike Deanna Troi's ability to sense vague emotions from time to time, seems to fall by the wayside as the series progresses, doesn't it? Also, warp drive. But we'll talk about that in about five seasons. Also, seriously. Maybe you've already commented on this, but here's my main question for the first few seasons of TNG: WHAT IS TROI DOING ON THE BRIDGE? That is all. As usual, I dig your blog. Carry on. You know, I feel like Picard is always plagued by his devotion to the Prime Directive. 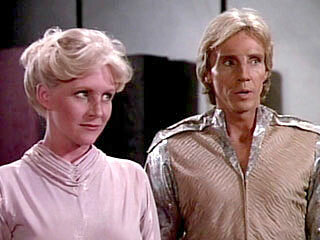 I find myself thinking a lot about the whole "we have a pet borg now" episode later. I foresee an "Adherence to the Prime Directive Among Starfleet Captains" pie chart in my future. lol, Troi was on the bridge as Picard's way of cheating at galactic poker (so to speak). I guess it's a bit like those wildlife documentary makers who have to watch as the wee baby turtles get picked off by the evil seagulls. I know there's a good reason for them not to interfere, but I'd never be able to stand back and watch. Yeah, I could never do it. I can't even watch the documentaries. There's no way I could be the guy behind the camera or even the guy in the booth recording the voice over. I turned it past Planet Earth the other day and found myself yelling at the TV, "What's wrong with you Sigourney Weaver? Have you no heart!?"